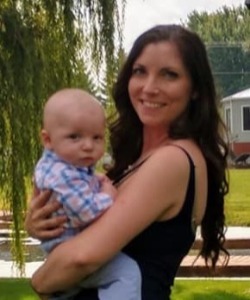 Brooke M. Harris, age 26, of Winneconne died unexpectedly Saturday, March 2, 2019. She was born September 24, 1992, in Carnegie, Oklahoma to Richard and Susan (Dunn) Harris. Brooke was currently employed by Cellcom in Neenah. Brooke was an amazing mother, daughter, sister, and friends. Caynen was her world and she loved him with everything she had. She was selfless and had a heart of gold. Brooke lit up every room she walked into. No matter what the situation, she always had a smile on her face. She will be truly missed by: her son, Caynen; her father and stepmother, Richard and Jennifer Harris, of Fremont; siblings, Josh, Courtney, Katelyn, and Gabriel; grandparents, Dale and Fletia Harris, of Carnegie, Oklahoma; John and Lona Schroll, of Larsen; Evelyn Carroll, of Hepner, Oregon; aunts and uncles, Timi and Ronnie McLemore, Angie and Trevor McCool, Kelly and Mica Harris, all of Carnegie, Oklahoma; Sue Schwartzbauer, Mike Schwartzbauer, both of Larsen; her mother and fiancé, Susan Harris and Brad Jordan, of Manitowoc; grandfather, Gerald Dunn, of Manitowoc; uncles and aunt, Steven Dunn, Bill Dunn, Mary Ellen Pekarske, all of Manitowoc; and many cousins and friends. Preceding Brooke in death were grandfather, Jerry Carroll; and grandmother, Charlotte Dunn. A visitation for family and friends will be on Saturday, March 9, 2019, from 10:00 a.m. until Noon at Grace Lutheran Church of Winchester, 8396 Steeple Hill Dr. Larsen, WI. A funeral service will be held on Saturday at Noon at the church with Pastor Connie Bramlett officiating. Brooke. I never had the joy, the honor of meeting you, and from what I've heard and read from mutual friends and family, I missed getting to know a lovely, joyful, dedicated young mother. Taken too soon. My heart wraps around your family. I It is mine as well. ( I summer-time grew up with your maternal [step-]grandfather; related to me from my dad's side.) Blessings, to you, on your journey to peace and light. Deep love, and comfort, and hope for all. My thoughts and prayers are with you all in this time of grieving and uncertainty. I am so sorry that I could not join you today in celebrating Brooke's life, but I want you to know that she will certainly be missed. Love to you all! I want to express my sincere condolences for your loss. I pray you will be comforted and strengthened by family, friends and the scriptures. The scriptures give hope that can help ease our pain (Isa 25:8; Rev 21:3,4; Ps 37:10,11 & 29). Your family is in my prayers. We want to extend our deepest sympathy and prayers to all of Brookes family, friends and especially to her beautiful baby boy. We knew Brooke back from high school when she was friends with our daughter. We remember many years of sharing special moments, meals and laughter with Brooke. Memories that will be in our hearts forever. May Brooke rest peacefully with the angels and Gods love surround her. May the Lord watch over Caynen as he grows and that he will feel his beautiful moms spirit and love within him always. Brooke, you will always be in my heart. I will forever remember you as the smiley, caring and beautiful soul you are. Rest easy beautiful, and watch over your son and family. ?? My thoughts and prayers are with her family and friends during this time of grieving. Lona - Our deepest sympathy to you and the family on the loss of your granddaughter. Our thoughts and prayers are with you all during this difficult loss. "When Someone you love becomes a Memory, that Memory becomes a Treasure"
I didn’t know Brooke personally but know so many that did know her. Never ever have I heard one bad thing about Brooke, it sounds to me as she was an amazing young lady who had numerous friends and an amazing personality and smile! By all the pictures and posts I am seeing show all of that and also prove that she will never ever be forgotten. Please know our hearts all ache for Brooke, her son and her family. You are all in our thoughts and prayers. May God wrap his arms around all of you and help you through the difficult journey you are all going through. I am so sorry this had to happen to you. Sometimes there are no words. Only thoughts from the heart. The Lord has you wrapped tightly in his arms. My deepest condolences to all who knew and loved this beautiful young lady. You’re being introduced to a new life in the Spirit right now Brooke, immersed with unimaginable Love and Light. Your smile will be forever remembered here, and will never leave you there. I love you brooke, it’s not fair you were taken away when you were love so fiercely by many. Your family and friends miss you terribly, but I know that in heaven you are now safe and god has granted you an eternity of happiness and warmth. We will all meet you at the pearly gates one day, please look out for us and in turn we will watch out for your son, siblings and mother, etc. Love for you reaches far, in this case Alaska to Wisconsin. Good bye brooke, Rest In Peace ?? My daughter is Brooke's best friend. I knew Brooke as a smiley, cheerful, sweet girl who valued her friends and family and enjoyed her life. I'm so saddened that she is gone from this world, especially that she is gone from her son. My daughter has told me what a great mom Brooke has been and how she adored her baby boy. My heart is broken for all those who knew and loved Brooke and particularly for Caynen, who will never know his beautiful momma. May she rest in peace and always be watching over her gorgeous baby boy.